The second lets you actually grab nodes and move them around. 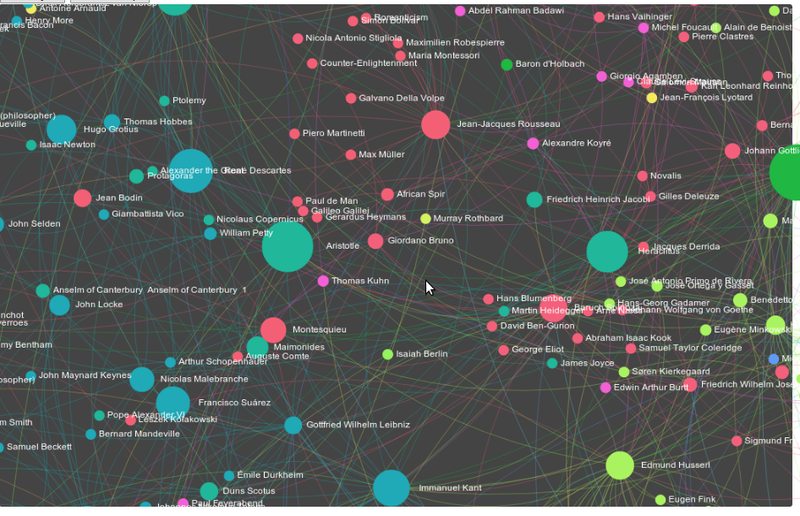 This might seem superfluous, but is surprisingly rich in how it lets you see the connected mass of the network---if you move a highly connected node who is also a major hub for different communities---like Hegel---and you'll see the entire graph react immediately. Move someone central, but deeper within a single community---like Hume---and you'll fnd the motions of the graph take some time to propagate outward. It'll move, but the speed it moves at is telling of a different kind of connectedness. This visualization uses a tool called D3 by Mike Bostock. The first graphs were pretty, but interactivity is a pretty big deal. It's more than adding another dimension to your plot---it fundamentally changes how you can interact with information. It's the difference between a lecture and a conversation. Live world tour (of Chicago) ...one day only. I'm presenting this general topic at the Chicago R User Group's meetup October 3rd. I'll post my slides here once they're finished. Stay tuned for Part III, where we'll go over the guts of different influence measures and layouts, what they mean and how to code them. In Part IV, we'll talk about some real life applications in finance (counterparty risk) and marketing. # This is one way of outputting to the sigma.js visualization, but it's probably best to go through gephi first.